Seat belts that have been fastened correctly can make a big difference. 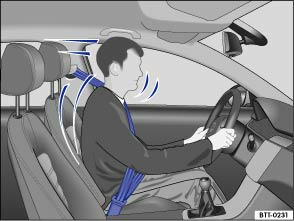 Seat belts, if fastened properly, hold the vehicle occupants in the correct sitting positions and considerably reduce the kinetic energy in the event of an accident. Seat belts also help to prevent uncontrolled movements which could lead to severe injuries. In addition, properly worn seat belts reduce the danger of being thrown from the vehicle . Passengers wearing seat belts correctly benefit greatly from the ability of the belts to reduce the kinetic energy. The front crumple zones and other passive safety features (such as the airbag system) are also designed to reduce kinetic energy. The amount of energy will thus decrease and reduce the risk of injury. The examples describe frontal collisions. Of course, properly worn seat belts substantially reduce the risk of injury in all other types of accidents. This is why seat belts must be fastened before every trip – even if you are just driving round the corner. Ensure that all passengers also wear their seat belts properly. Accident statistics have shown properly worn seat belts to be an effective means of substantially reducing the risk of injury and improving the chances of survival in a serious accident. Furthermore, properly worn seat belts improve the protection provided by airbags in the event of an accident. For this reason wearing a seat belt is required by law in most countries. Although the vehicle is equipped with airbags, the seat belts must be fastened and worn. For example, the front airbags will only be deployed in certain types of front collision. The front airbags will not be triggered during minor frontal collisions, minor side collisions, rear collisions, rolls or accidents in which the airbag trigger threshold in the control unit is not exceeded. Therefore, always wear your seat belt and ensure that your passengers have fastened their seat belts properly before you drive off! What happens to passengers who have not fastened their seat belts?